Flavonoids have drawn attention because of their antioxidant capacity and anti-carcinogenic effect in various types of cancer. A limited number of studies has investigated their potential effect on the risk of bladder cancer, with inconsistent results. We analyzed data from an Italian case–control study including 690 incident bladder cancer cases and 665 controls admitted to the same network of hospitals for acute, non-neoplastic, non tobacco-related diseases. Subjects were interviewed using a reproducible and validated food-frequency questionnaire. We applied data on food and beverage composition to estimate the intake of isoflavones, anthocyanidins, flavan-3-ols, flavanones, flavones and flavonols. We estimated odds ratios (ORs) through multiple logistic regression models, including terms for potential confounding factors, including tobacco smoking and total energy intake. 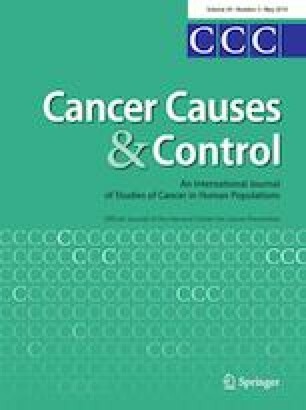 We found an inverse association between isoflavones (OR for the highest compared to the lowest quintile of intake = 0.56, 95% CI 0.37–0.84) and flavones (OR = 0.64, 95% CI 0.44–0.95) and bladder cancer. Non-significant inverse association was found for flavan-3-ols (OR = 0.70), flavonols (OR = 0.85) and total flavonoids (OR = 0.76). The results were consistent for non-muscle-invasive and muscle-invasive bladder cancers. Our data indicate an inverse association between isoflavones and flavones with respect to bladder cancer risk. The online version of this article ( https://doi.org/10.1007/s10552-019-01158-2) contains supplementary material, which is available to authorized users. This work was supported by the Italian Association for Cancer Research (AIRC) (My First AIRC Grant No. 17070). V.R. was supported by a fellowship from the Italian Foundation for Cancer Research (FIRC No. 18107). We also acknowledge the Lega Italiana per la Lotta contro i Tumori Sede Centrale for the contribution on the 5/1000 Project, 2015.